‘Nightvision’ shows two mutually dependent visions produced by a crew that Chodzko assembled of lighting technicians (‘sparks’) who’s work is to facilitate the lighting for clubs and concerts. Chodzko wanted to work with people who normally remain out of visibility, but, from the semi-darkness of ‘back stage’ (or marginal) space, are able to remotely determine the appearance, atmosphere, clarity, depth and colour of the space the viewer is experiencing. The process of the physical preparation for this illumination is made visible on video by the sickly false ‘light’ – a green phosphorescence – ‘seen’ by an image-intensifier (or nightvision) lens. Their individual interpretations and recommendations for their vision of how ‘heaven’ should be lit manifests itself through a voice-over recorded by Chodzko late at night in the interviewees’ homes, so that their voices sound relaxed, gentle, sleepy, faltering even ‘dreamy’. Their individual guidance and group rigging process – shown on one screen – both lead towards a moment where we witness, on the screen opposite, the realisation of their activities. It’s a glimpse, a barely formed ‘stab in the dark’ at transcendence after the long build up of a religious ritual. 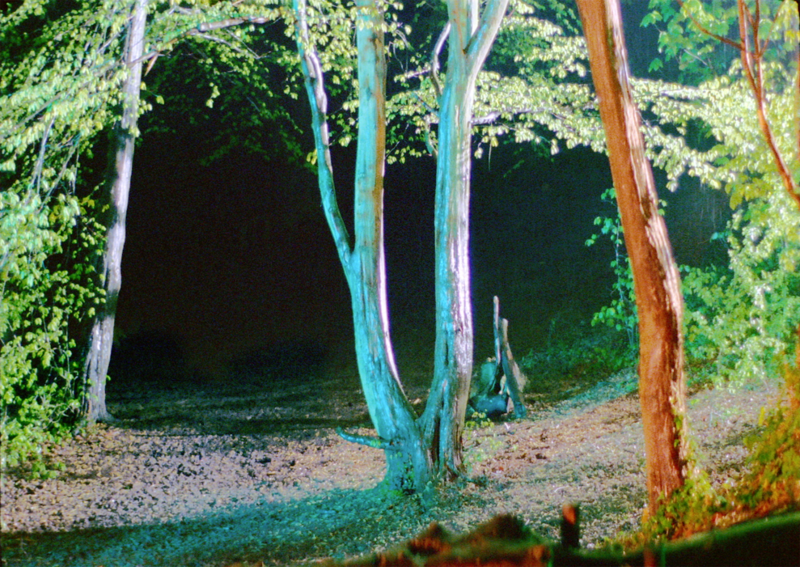 It’s a democratic solution, incorporating elements of their separate counselling turned into a collective whole, but inevitably marking a disparity between the contradictory, idealising nature of their verbal recommendations (some very technical, some more poetic) and the actual visual reality of the illumination that results. It forms a brief peculiar space; ‘heaven’ as an assemblage of different visions; golden, bloody, icy blue and bounded by darkness. The accompanying audio seems relatively silent here due to the cessation of the advisory voices yet it is also somehow ‘full’; the buzzing of electrical feeds and incandescent bulbs giving way to a perception of a more delicate wood atmos; rain pattering on leaves, a distant rumble of thunder. This scene’s brief manifestation (for 83 seconds) appears to cut out (or ‘overload’) the image-intensifier camera filming the crew, making that space (and its screen within the installation) dark, or ‘blind’. But the new arcadia the crew have prepared becomes quite quickly and steadily terminated through a switching off of the lights. As this screen returns to darkness the original sequence of the crew waiting to prepare the illumination steadily appears (in the loop) on the screen opposite. The disappearance of one space allows the visibility of another. There is a form of reciprocity. For one to exist the other must disappear or be deferred. Darkness appears to be the permanent (and ‘natural’) state here, alleviated only temporarily by imaginations’ multiplicities. There is the generating of a brief community, catalysed by Chodzko, who meet to improvise ‘something new’ from their collective knowledge (eg; cell-a (2001), and Expulsion from the Garden of Eden (2015)) . There is a sense of both the pragmatic and the sacred operating in a close dynamic but almost inadvertent relationship; the spiritual via a non-hierarchical ‘everyday.’ The ‘sparks’ are now playing god; ‘making heaven’, (in the same way as we could find god in the pages of a classified advertisements paper – The God Look Alike Contest (1991) – or rituals of transformation in charity shops: White Magic (2005)). There is the promise that the artwork itself, through the ritualistic processes that are seen to operate within it, and a form of hypnosis activated by the image, will channel something exceptional, magical, a shifting of perception. But there’s also the simultaneous retaining of doubt that that might not ever be possible (eg: Plan for a Spell (2001), M-path (2006), Echo (2009), or Deep Above (2016)). There is also an activation of doubt as to how much we, as a viewer, are making what we experience in the artwork and how much the artist is interfering in the ‘reality’ of an apparently documentary process? 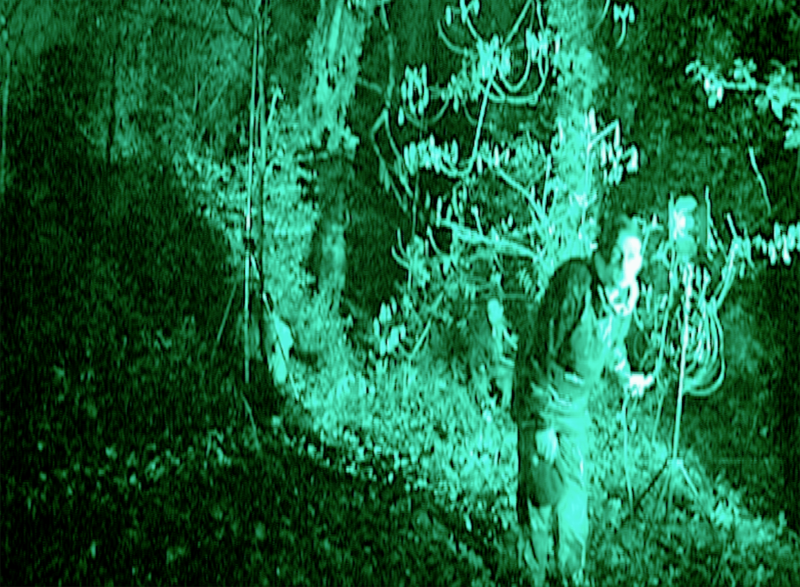 Is that ‘voice’ within the electrical buzzing in Nightvision something we imagine, or is it constructed to make us ask that question? There is a sense in which a place, or the thinking about a place, holds a duality, an oscillation within another space it is somehow dependent on (eg: Better Scenery (2000) and Because…(2013)). There is the nocturnal as a space that both conceals and creates a special activity of vision (eg Nightshift (2004) and relationship to both sleep, guidance and dreams (eg Sleepers (2016) and Ghost (2010)). 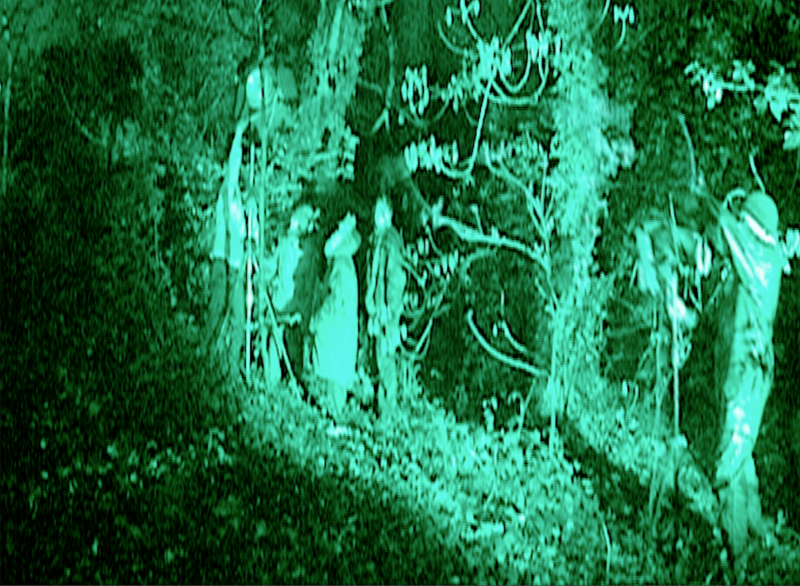 Nightvision also works with a sense of the precarity of an image (eg: Too (2013)). 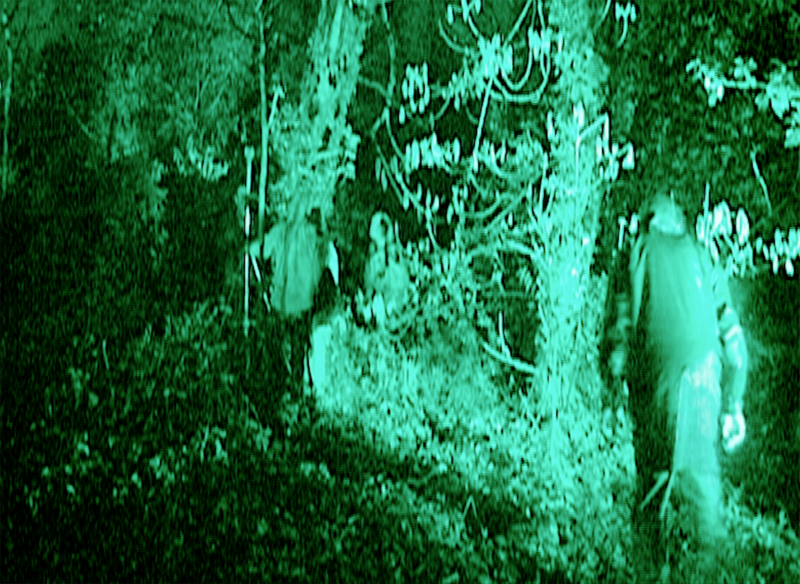 It is about wanting, sorting out and preparing an image (eg: Desert Island (2013), or Same (2013)) and the absurdity of the labour involved in this, particularly, in Nightvision a labour in relation to cinema; hours of planning, setting up and expense in order to make 83 seconds of film. And then it rains! I would light heaven with the biggest source of lighting I could find, perhaps a straw colour, a warm translucent light through the trees , a light mist, lots of greenery, but graduated colour being swept in from the front from indigo right up to your warm colours. I ‘d put a 20 or 10K behind a huge frame with graduated gels, just strips of gels across, creating all your graduated colours and they’ll bleed into each other and they’ll create a rainbowy effect. To stave off the darkness you’d have to blast it with a lot of light . You’d have to put a lot of light source in there, but then you would lose the night. I could turn a forest into day but I’d have to pump a lot of light in there. And you’d think it was daylight and then you are creating your heaven. 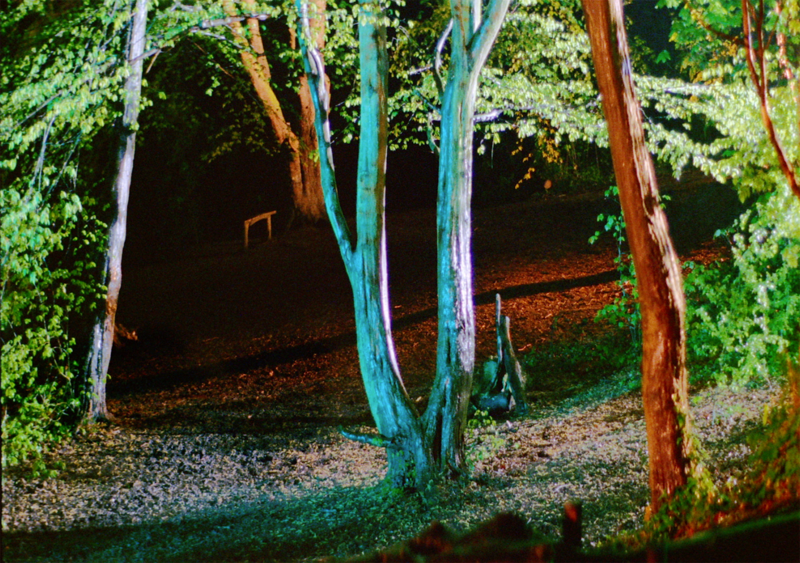 But to shoot at night I’d put a light mist in because when you’ve got the mist it hides a lot of the dark. If you are trying to light heaven you would have to utilise what is already there…using filtering, diffusing, reflecting, creating shadows, in order to move the light, transform the light, bounce the light around, protect areas from light. In a space like that with trees and bushes, in trying to light heaven, I would want to see shadows cast from objects that were preventing light entering the space…I would be looking at ways of enhancing, exaggerating some of the textures that are already in there; the leaves, the bark, the forest floor, a softer, darker orange or possibly green, filling in the shadows from the… key light and then adding in some textures into that as well..
Light in heaven would be over all a warm glow of sunlight but in all areas there would be additional lighting in the form of patterns,…as well as these there would be great shafts of light coming from all directions; some of solid colour and some mixed changing colours. 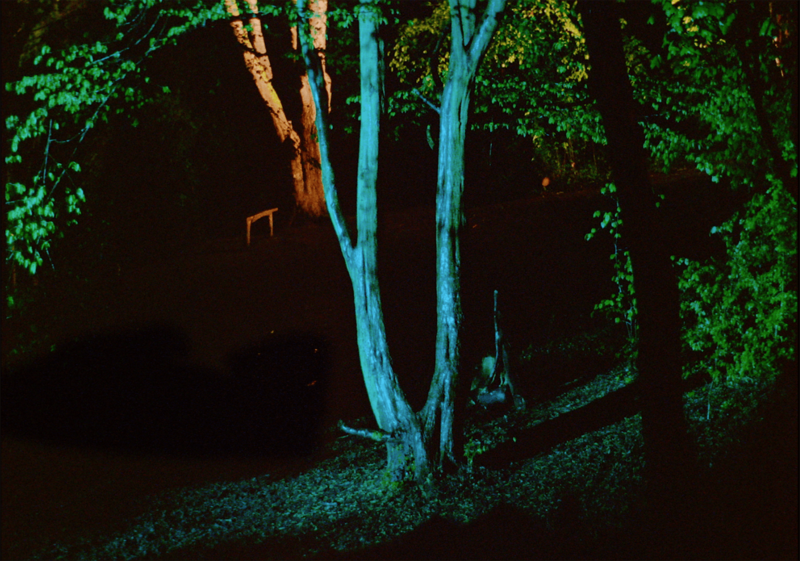 …Create the effect of there being no ground by extending the light that goes onto the trees straight down then by using it as a projection surface it would feel like no up and no down,… and would be a sort of ‘floating in space’ sort of feel. 2002 ‘Life is Beautiful’, Laing Art Gallery, Newcastle upon Tyne, UK. 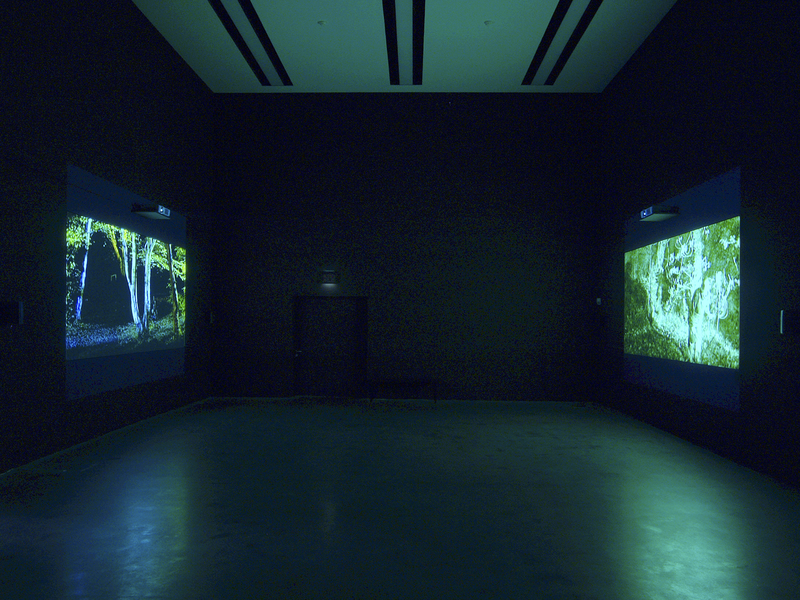 'Nightvision' installation in 'Documentary Creations' (2005), Kunstmuseum Luzern. All images are copyright Adam Chodzko 2019. Website design by Realising Designs.